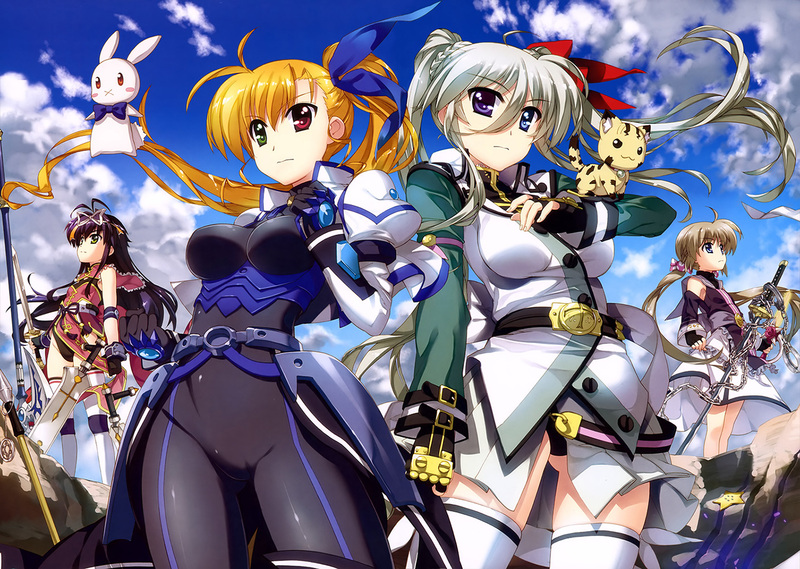 Synopsis: Set four years after StrikerS, Nanoha finally has time to get off her feet. 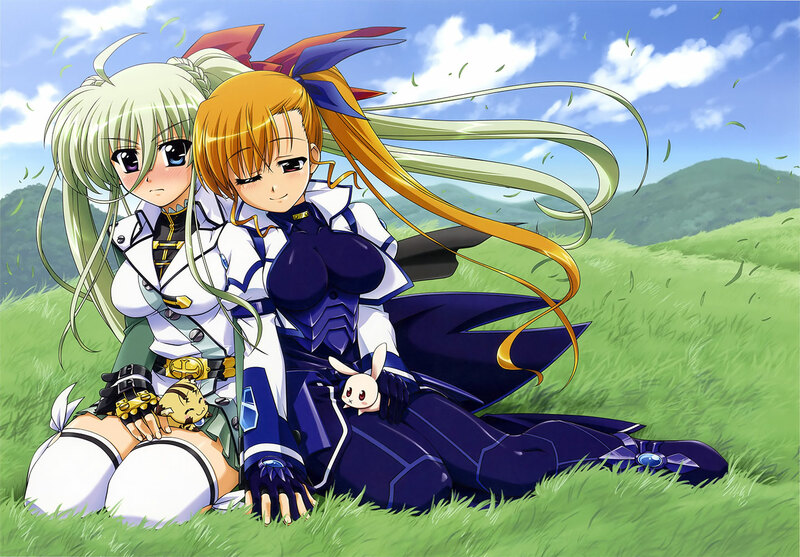 Now explore the Nanoha world in Vivio Takamichi’s shoes and her device, Sacred Heart. First off, let’s not beat around the bush, and let me just call it like it is… story-wise, I think this is a abject failure. Of course, I’m talking about how things “ended”, but that wasn’t the only issue with ViVid. When the final episode was over, I was checking to make sure that there wasn’t a thirteenth episode, because no one in their right mind would end the season like that. Seriously, what was that?! You spend a majority of the season focusing on sparring sessions and mock battles that don’t mean much, but you can’t find the time to actually conclude something as important as the Intermiddle Championship? That’s just inexcusable. As we’ve seen before from this series, ViVid also suffers from pacing issues that mar the experience and are probably the number one reason why things turned out like they did. Whether it’s the fanservice-laden hot springs filler, the exceedingly long transformation scenes, the excruciatingly numerous training scenes, or any number of other reasons, I just didn’t find this show to be very interesting, at least compared to previous seasons. 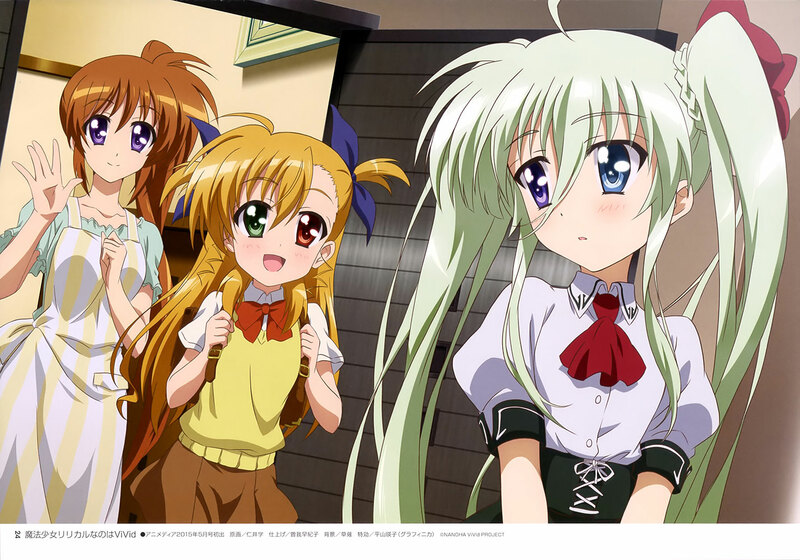 One interesting story element was Einhart inheriting the memories of one of her ancestors, yet that ultimately didn’t evolve into anything interesting and just became a throwaway plot point and another example of wasted potential. Despite how I’m making it sound, it’s not all bad, as the Intermiddle Championship provided a sorely needed shot in the arm for this season, but as has already been stated, what started off as a promising tournament ended in the worst possible way… with no real ending. Even before that, it was predictable how the tournament was going to play out, but until we see the remaining matches, I can’t justifiably score this much higher than I did. Besides the ViVid Strike! spin-off (oh goody, a spin-off of a spin-off), there have been rumblings of a second season that’s yet to materialize, so who knows if or when this will see a proper conclusion. But given how this season turned out, my optimism is rather shaky, so I’m not really in any rush to be disappointed again. As you might be able to tell from the title, Vivio is the main protagonist in this spin-off, but when all is said and done, I felt like she took a backseat to Einhart. In StrikerS, I really liked Vivio. She was super cute, and seeing her suffer like she did was really disheartening, but I think it helped me care more about her than I otherwise might have. Flash-forward to ViVid, and I didn’t get that same sense of charisma and charm from her, and that’s disappointing. It probably didn’t help that her character development almost single-handedly rests on her desire to advance her combat skills, with almost no room for any meaningful character development. She’s not the titular character, but more than any other character in this story, it’s Einhart that had the best showing in my eyes. When we’re first introduced to her, she almost appears to be a villain, but even though she clearly wasn’t, I think that helped give her some personality that I never found in Vivio. Compared to most of her peers, she had an air of maturity that I really liked (and she had the voice to match), and by the end of the season, I felt like she had taken the place of Vivio as the main character. Other than these two, I found the majority of the cast to be underwhelming, with few characters that I even cared about at all. Besides NanoFate, I thought that Nove was easily the best of the bunch, so when it comes to her, there isn’t much to complain about from me. Many of the other mages (like Chantez, Micaiah, Fabia, Victoria, Sieglinde, Miura, Corona, and Rio) either don’t get many chances to shine or they don’t make the most of their opportunities, so I think the cast of characters is a mixed bag. Over the course of a decade, Nanoha and Fate have gone from children to full-blown domestic goddesses, and it’s been strangely fascinating to see. In ViVid, they reprise their roles as Vivio’s mamas, and despite the shift in focus over to Vivio and Co., they still have their moments at home, including a bath scene together (which also includes Vivio) that leaves little doubt that they’re more than just “best friends”. Sadly, that’s the NanoFate highlight of this season, as a majority of their other scenes involve them taking part in mock battles that leave no room for any kind of sweet interactions between the two. 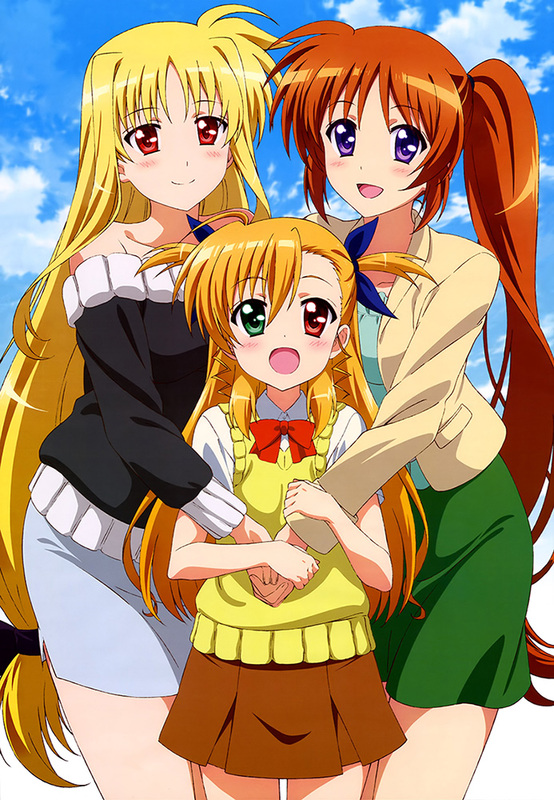 This season may have been less-than-stellar in some regards, but at the very least, the creators got the memo that you can’t have a Nanoha season without NanoFate, so at least that’s one thing that wasn’t botched. As is sometimes seen in spin-offs, the studio handling the main series (in this case, it’s been Seven Arcs) has passed the baton to a different studio (A-1 Pictures) to handle things, and the results are mixed. On one hand, with this being the latest installment in the franchise that comes eight years after StrikerS, this is visually the technical high point of the series, but on the other hand, the change in art style is somewhat jarring and takes some getting used to, especially when you see characters you’ve grown accustomed to looking different than you remember. Overall, I’m not a fan of the new look, but I eventually got used to it. It’s by no means a deal breaker, yet it’s sure to irk some people more than others. This time around, the music at times has a bit more of a rock tinge to it, and that was a pleasant surprise. Beyond that, the rest of the music wasn’t anything to write home about, however, there seemed to be a little more variety to the music, and that’s rarely a bad thing. The tradition of a Nana Mizuki OP and Yukari Tamura ED continues with this series, and even though I can’t say that I enjoyed either as much as the themes from the main series (not even the KinMoza-sounding ED), they’re solid themes that I can’t really complain about. Voice-acting isn’t an issue, so the audio more or less maintains the status quo. Either way, Magical Girl Lyrical Nanoha ViVid struggles to recreate the magic of past Nanoha seasons (no pun intended), and between the lack of a conclusive ending, the less-than-exciting stretches of training/sparring, and an abundance of new mages that aren’t really given enough time to endear themselves to viewers, this is a rather weak entry in the Nanoha series that could’ve been a lot better. This entry was posted in Anime, Anime Review and tagged Magical Girl Lyrical Nanoha by Rock The Vogt. Bookmark the permalink. The problem is they rushed through the manga at an insane pace to get to the worst possible stopping point. Ideally, they would have ended before the tournament even started, realistically a decent stopping point would have been right at the beginning of the tournament and hyping up the tournament itself as the possible season 2. LOTS of character development/etc was lost in the mad dash they took to get this point, and it shows heavily. So they kept all the problems from the manga and chose not to address them in the anime? Seems like a dumb move on their part. Hard to believe a lackluster Nanoha show like this was made, but am in agreement with you Rock. The first two episodes are pretty good (possibly all the NanoFate moments? ), but then loses it’s shine bit by bit. And sooo many characters! I really had trouble keeping track of them all. The one thing that had me scratching my head was Vivio’s strength. I mean in StrikerS she seemed to hold her own against Nanoha. Then in the mock battle in ViVid, Einhart almost defeats Vivio, and then Nanoha almost defeats Einhardt. It seems like they weakened her for ViVid? You would be correct in some ways. Also recall that she was grown up and other things. this is a YOUNG Vivio who is a normal human for the most part. Her not being at that power level is not inconceivable at all. The reason why Vivio is not that strong in VIVID is because her Linker core (that one organ that regenerates magic) is damaged. Remember in StrikerS finale, Nanoha shot her with 3 (or 4? probably more) Starlight Breakers at Point blank to forcibly removes Vivio’s connection to the Saint Cradle. So, yeah! She reverted back to “rookie level” during VIVID is not strange at all. Hmm, disappointment is disappointing. Alas. And hold on a sec… There’s a manga for Nanoha? How did I not know this? Maybe I could afford to buy the manga instead. Oh! The anonymous is me. I forgot to sign in. Ha. Have you guys reviewed Yamibo yet? I haven’t watched it yet, but I do know that it is Yuri. Heh, kind of a long link. Sorry about that. Oh guys! Seven seas is doing a survey on their website for suggestions on manga to localize. We should all suggests some Yuri. I already did Fu-fu. Maybe an AU Gakkou Gurashi where they sing and dance, and at the same time take out zombies?